When I first met Nicolas Hammann, he was beaming, as though he still could hardly believe this was his life now. He's a young guy, almost 22 years old. He grew up in Elkhart Lake, WI, doing some karting and road racing when he could. Just last year, he was at UNC Charlotte working toward a degree in mechanical engineering as a way to stay around cars in the future. Then he qualified for GT Academy. Jump ahead to January 2015, and Nic is in his first pro race, the 24 Hours of Dubai, representing Nissan behind the wheel of a GT-R GT3. 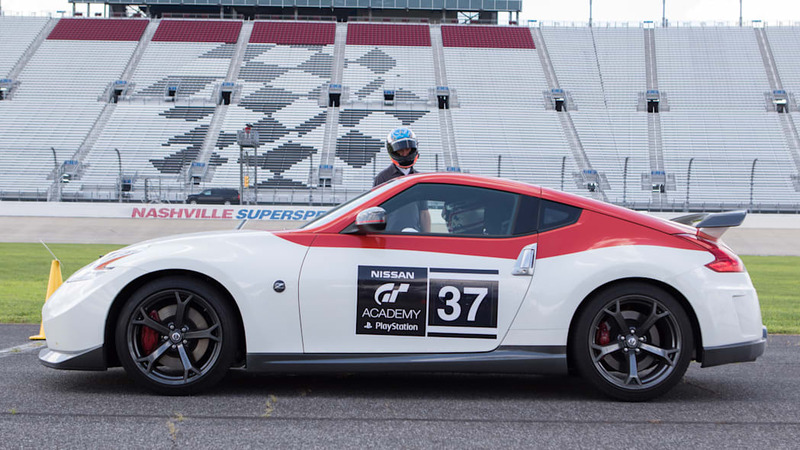 And now he's here at the 2015 GT Academy Finals in Nashville, TN, acting as a sort of ambassador from the other side of the challenge – an example of what each of these guys hopes to achieve. After this, he's off to race at Lime Rock in the Continental Tire Sports Car Challenge. After that, back to his home turf at Road America. 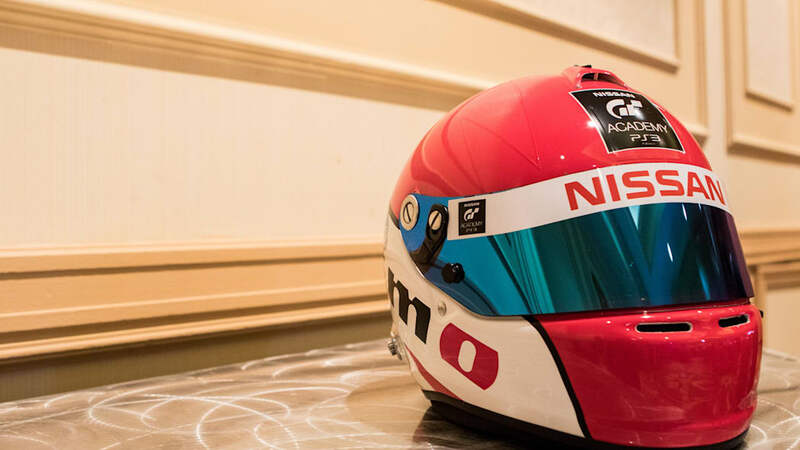 Nicolas Hammann's dream of becoming a pro racer has come true. 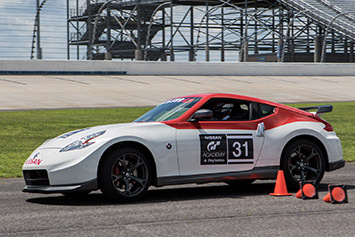 The GT Academy National Finals are made up of four parts, equally weighted. Within each program, though, there is room for interpretation - a gray area where those in charge can make judgment calls about character and whatnot. 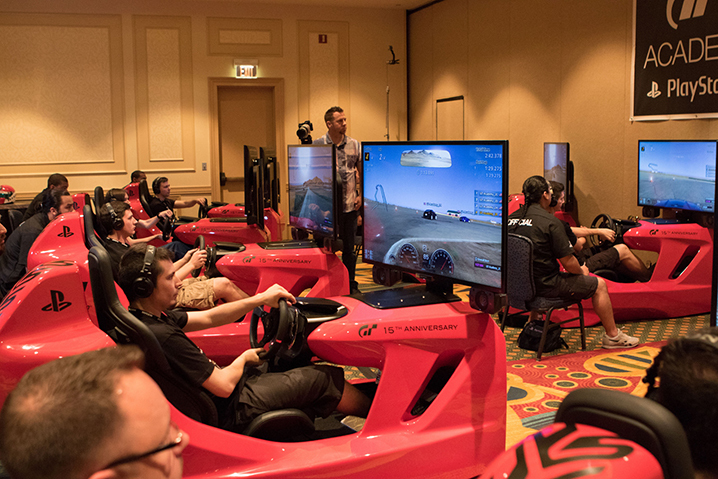 On the first day, the competitors take part in a Gran Turismo 6 tournament, as well as a PR test. Day two is made up of a grueling physical challenge and a driving test behind the wheel of an actual car. 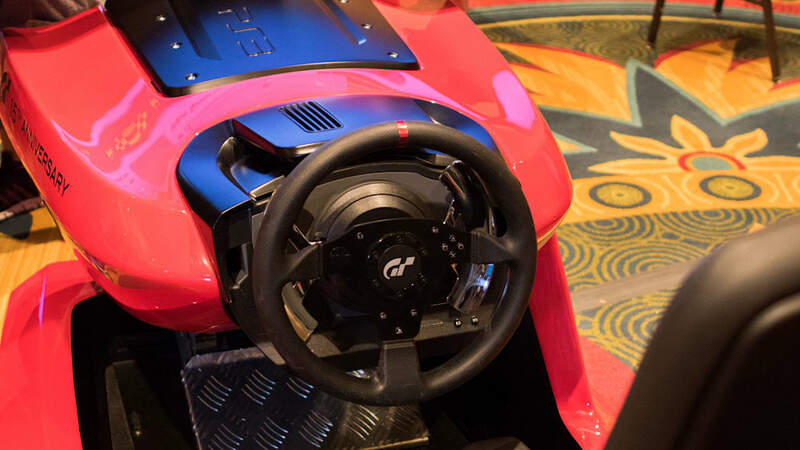 The virtual racing takes place in a single room with multiple "sleds" — console setups with a built-in screen, Thrustmaster T500 force feedback steering wheel, and a pedal set. It is particularly balmy in Nashville during the first day of Finals, and all of the equipment — including a setup to livestream the competition on Twitch TV — makes the room uncomfortably hot. In this first part of the competition, drivers score points based on their finishing positions over a series of four rounds per group. Scrutineers look on to make sure everyone is playing above board. Between rounds, the individual competitors go before a panel of Nissan reps for the PR test, and they are asked a series of predetermined questions (with room for improvisation, of course). While the answers themselves provide some useful information about the competitor, it's the way they compose themselves that's really under inspection during this segment. 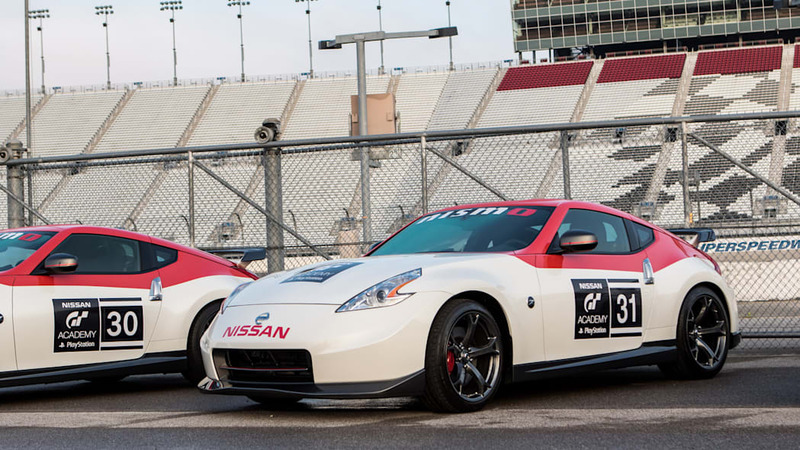 After all, whoever goes on to race will be representing Nissan, Sony, and the country on a global stage. The longer a competitor is in the room the better, I'm told by the Nissan folks. It means the interviewee spent more time charming the panel. 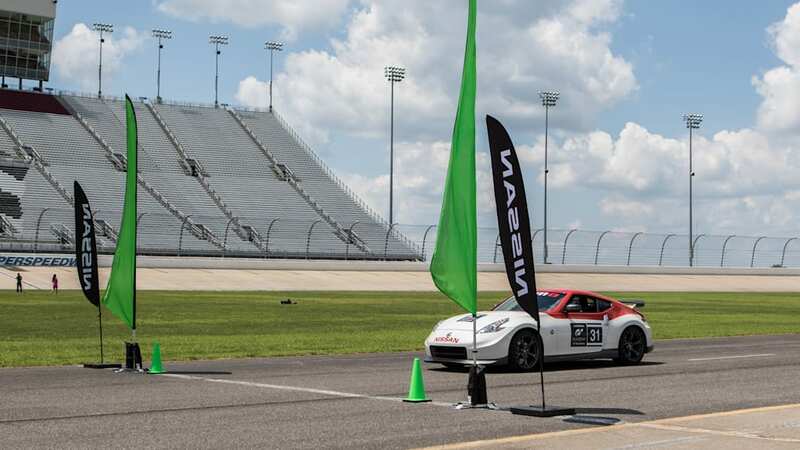 Day two of the finals takes place at the Nashville Superspeedway. After a brief pep talk, it's time for the physical challenge. It's made up of three parts: push-ups, planking, and what they call the "bleep test" (others may know it as the PACER test) — all in Nashville's thick summer heat. The push-ups cover upper body strength, planking for the core, bleep test for cardio, but all three tests measure endurance. Each exercise lasts until the last person drops out. The challenges, of course, also showcase less concrete but equally important qualities like determination and attitude. 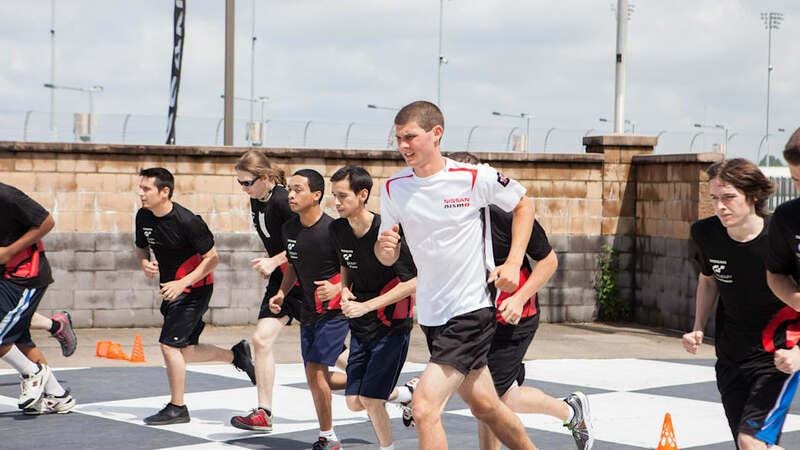 During the physical challenge, Hammann, last year's winner, runs alongside both groups performing the bleep test. He doesn't stop until the last competitor drops out. Immediately afterward, Nic gathers up the cones, still trotting. "You made that look easy," I tell him. He shrugs, still smiling. "I hope so. I train for a living." 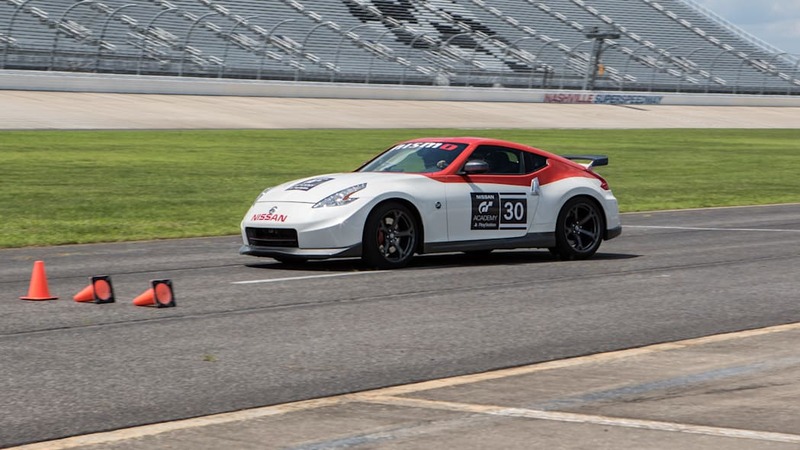 While the virtual competition is what got them here, getting behind the wheel of an actual, metal and rubber Nissan 370Z Nismo is a totally different experience. The judges are looking for specific things over the two consecutive laps each finalist drives. 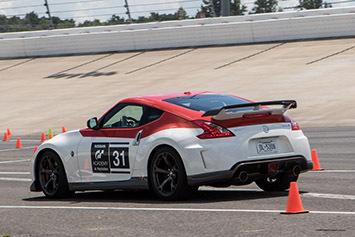 Avoiding cones, of course, is important, though if a driver knocks over a cone "beautifully" with the rear of the car, that might not add seconds to their time. Judges are also looking at technique and how well the driver takes instruction from the coach in the right seat. 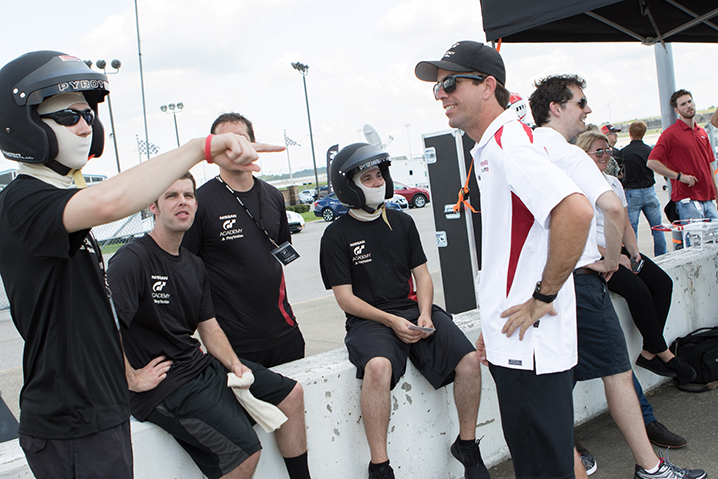 The ability to listen and adapt is highly valued, though lap time is the most important part of the test. After taking their two laps apiece, the drivers wait for the other competitors to finish. They're told they could get the results before they even leave the facility. The pressure, though, has subsided as the day goes on, and most of the drivers appear to be relaxed as they wait. Perhaps they're just exhausted. Hammann has been a Gran Turismo fan for years, and fondly recalls playing Gran Turismo 2 for the original PlayStation. To go from fandom to representing the franchise is "really cool." He grew up karting with his dad at Road America, and doing a little bit of club racing here and there. "I always loved racing but couldn't afford to do it at a professional level," he says, which led him into mechanical engineering, where he could see himself someday working around the sport he loves. Around the same time, he heard about the GT Academy. He tried his hand at it, but didn't qualify. 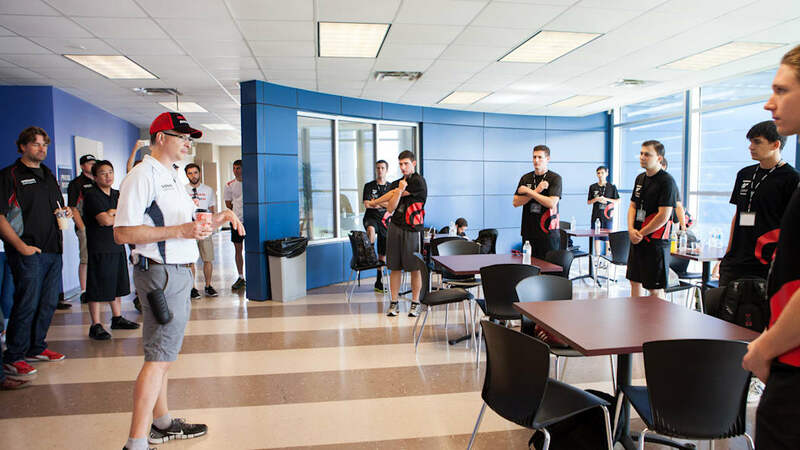 At school, he had more time to practice racing online and honing his skills at Gran Turismo. His second year, he finished 50th. The next year, Hammann's parents gifted him a Logitech G27 steering wheel, which he thinks helped his game a lot. 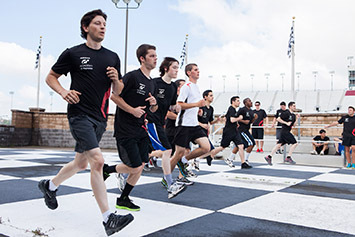 He made it into the National Finals in New York, and advanced to the next phase: Race Camp at Silverstone. 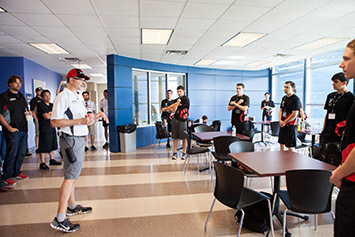 Hammann moved into his place at college the Friday before he left for Silverstone. That weekend, he told his parents, "I've got to win this competition, because I don't want to go back to school." He just wanted to race. He got his wish, and since his win at Silverstone, he says he's been "living the dream." And in that statement is exactly what Nissan, Sony, and Polyphony Digital are offering to players: a chance to live their dreams. It's an alternative route into pro racing where people with raw talent and passion – who lack the huge sums of money it takes to launch a racing career – get a shot to prove themselves. 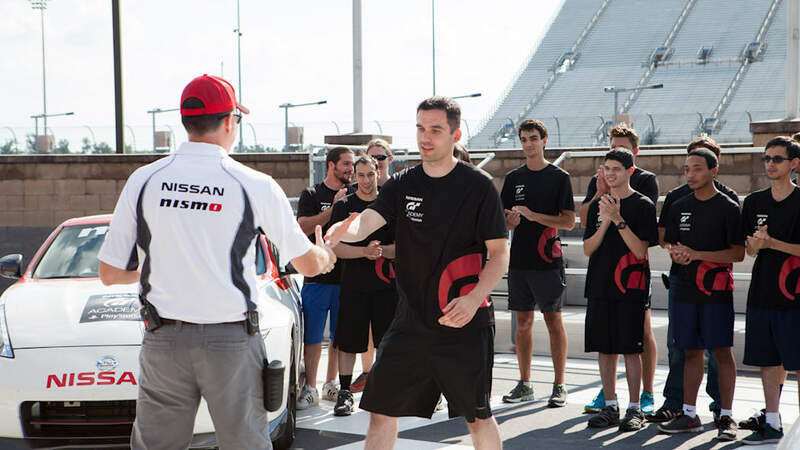 Bryan Heitkotter, the third winner of GT Academy (in 2011), has a similar story. "I've always loved cars. 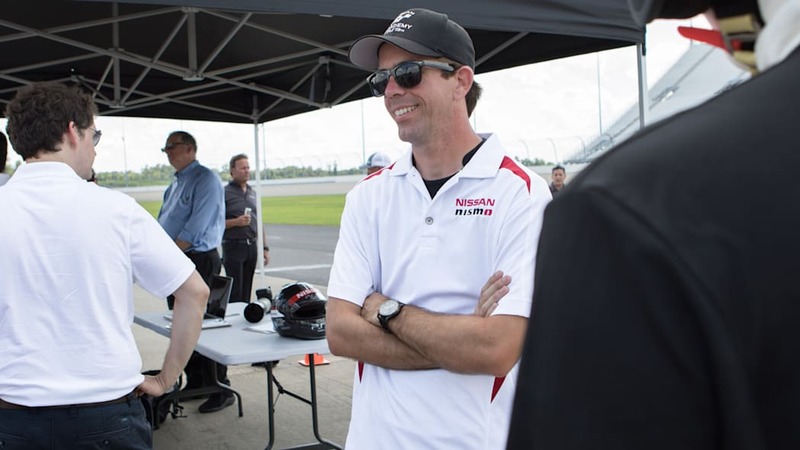 I've always wanted to race ... since I was very little, and all I could afford to do when I was an adult was autocross and maybe the occasional track day." 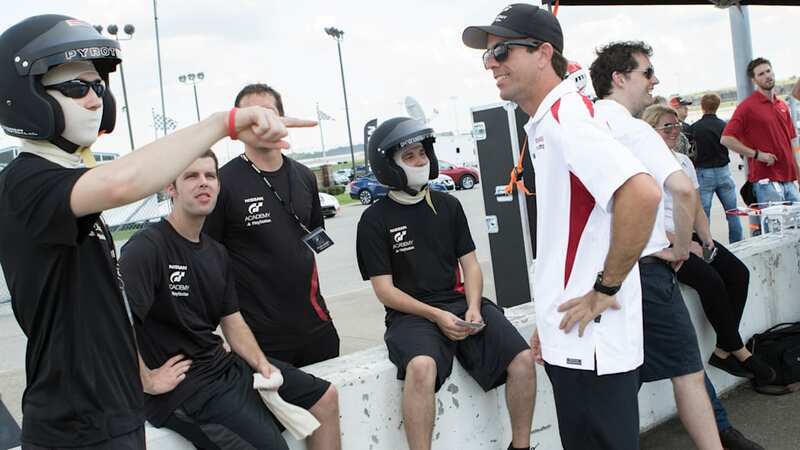 Bryan had been laid off from his job delivering parts for a car dealership before he entered the GT Academy at age 30. Now, Bryan is currently in third place in the GTA class championship of the Pirelli World Challenge. Just as consistency is essential to success in racing, it also appears to be a recurring theme when it comes to the GT Academy. Some of the competitors have qualified in previous years, and either didn't move on to Silverstone or, in the case of one driver, an untimely injury kept him from attending. The fact that out of some 30,000 participants, the same guys repeatedly end up in the top 20 speaks to their steadiness. Other things proved to be consistent, too. Everyone I talked to, previous winners and hopefuls alike, are passionate about cars. And though every contestant I questioned is fanatical about Gran Turismo, none of them are gamers in the traditional sense. 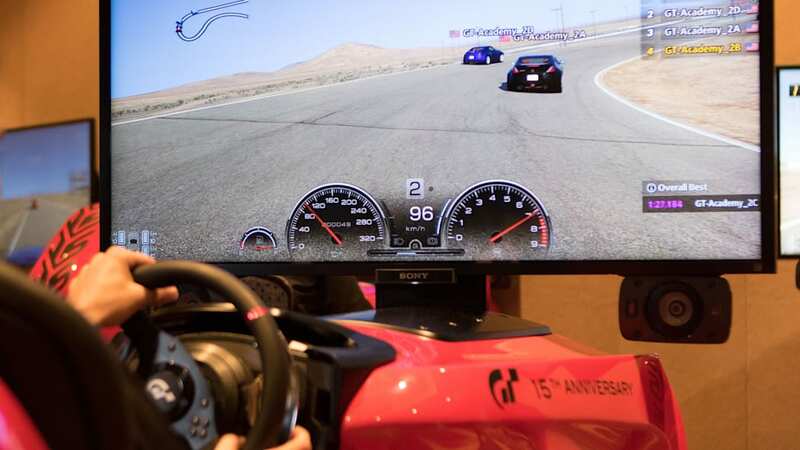 Racing simulators seem to be where their video game fandom begins and ends. 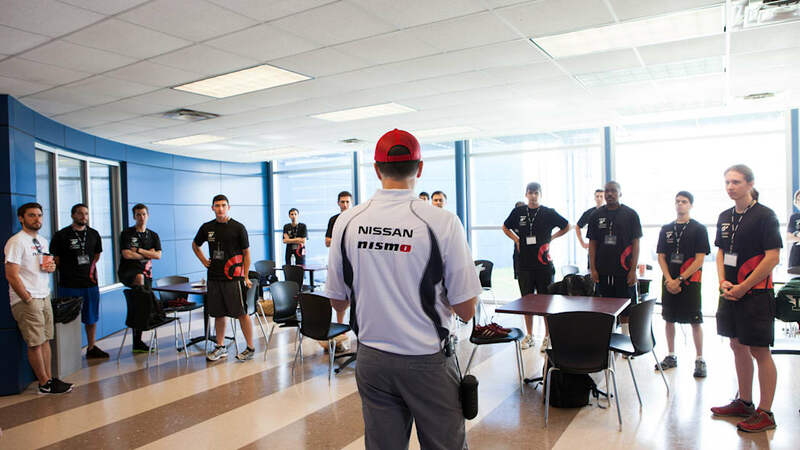 While consistency is clearly a large part of what gets people to the GT Academy Finals, to move on, competitors need to possess another vital quality: adaptability. If one doesn't have a lot of racing experience, the shift from virtual to real driving requires quick readjustments. If you're Hammann, with some experience in road racing, tackling an autocross course for the first time can seem a little foreign. "Some of the same stuff applied, so I just tried to be calm and get through it the best I could." But, he says, a lack of experience is something that these new drivers have in their favor. With less exposure to racing, success depends on taking well to instruction. If a coach tells one of these guys how to do something, or do something better, as Hammann says, "You don't know any better, so you listen." 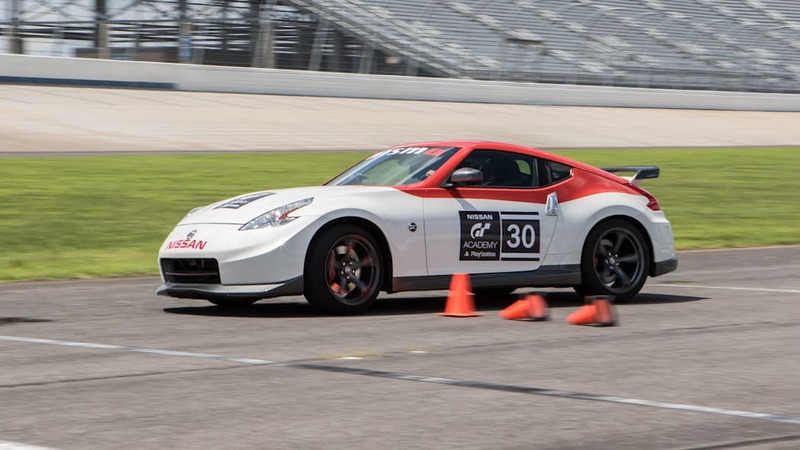 There are ways to give yourself a better shot at winning once you make it to the GT Academy Finals. After Heitkotter qualified, he joined a gym for the first time in his life. 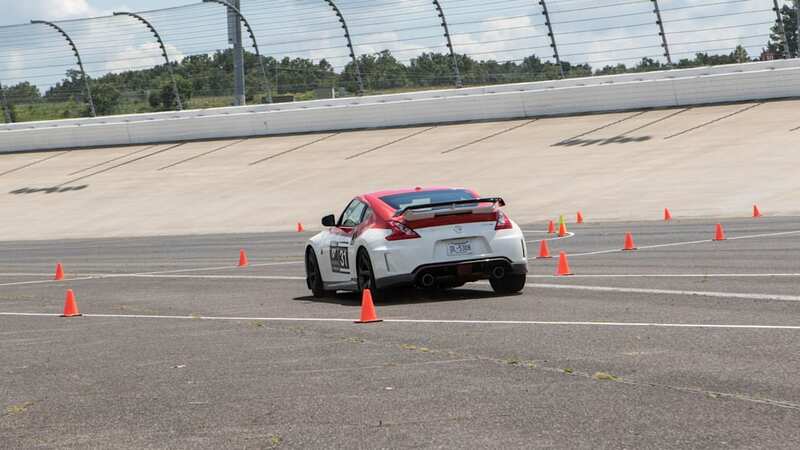 He went to autocross school to hone his skills, got someone to lend him a Nissan 350Z to get a feel for what he'd be driving, rented a kart for a day, and thoroughly planned his mental strategy for possible situations he'd encounter throughout the event. "I put everything I had into this," says Bryan. 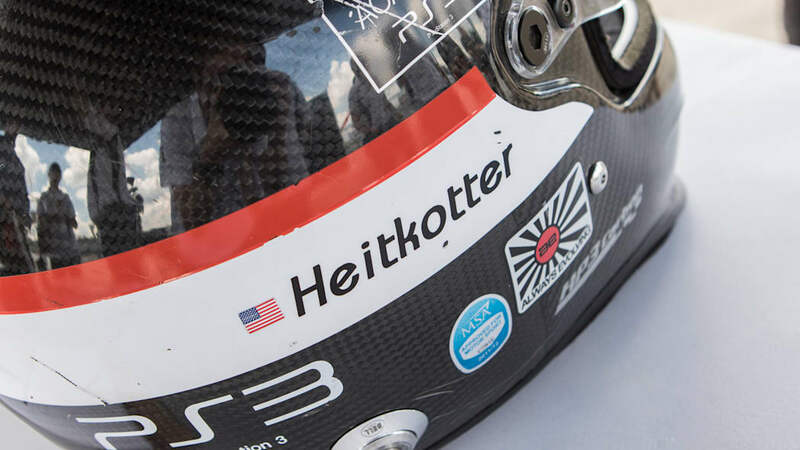 Hammann played a lot of Gran Turismo 6, racing a couple hundred miles every day, more on weekends. He was surprised to see that he had logged something like 3,500 miles at his favorite track in the game, Spa-Francorchamps. "It was the one time in my life that my parents said, 'Get downstairs and keep playing video games.'" After being notified that he was going on to Race Camp at Silverstone, he began a training regimen of running every day, lifting weights, and putting himself in as many different types of driving and racing scenarios as he could to help him learn how to adapt quickly. 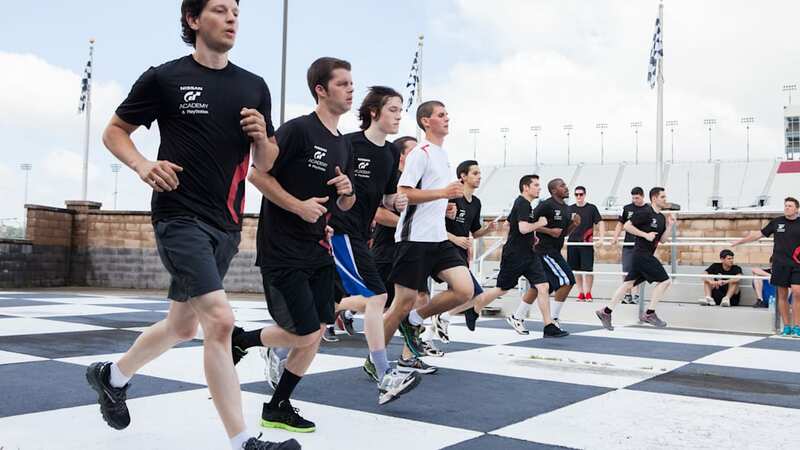 The training doesn't stop after graduating from the finals, winning at Silverstone or even after a successful pro race. He lifts weights at least three times per week, does a shorter run on the days he lifts, and longer runs or bike rides as well as some core workouts on the days he doesn't. Ahead of a race, Hammann still uses Gran Turismo to learn the tracks and to mentally prepare in order to maintain focus for long periods of time. Heitkotter also sees the game as a valuable training tool. "It works well because Gran Turismo is, first of all, fairly realistic. If you use it in the right way, it can teach you an awful lot, more than most people would think." Concentration, Bryan says, is one of those things you can learn. "It will develop your ability to stay focused on what you need to do and keep distractions to a minimum." Finding your zone, and staying in it. That's how it has helped Bryan, anyway. This year's winners also saw the value in preparation. Ryan Lynch came short of the top 20 spots in the online contests leading up the finals, but he was called up as an alternate. 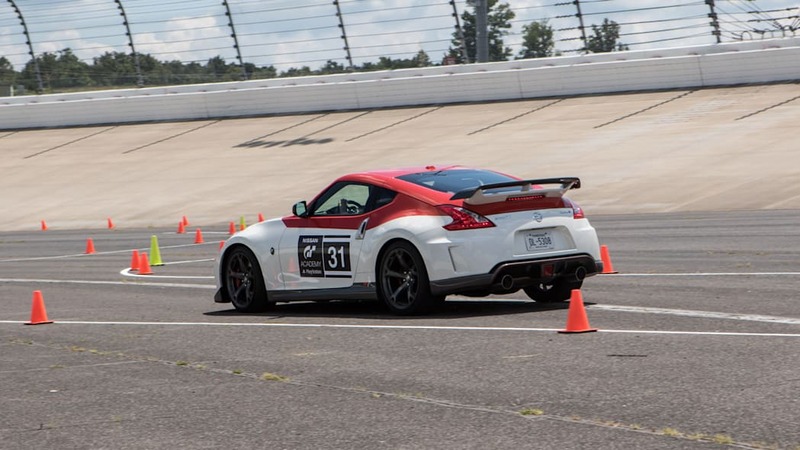 Despite the uncertainty of even making it to Nashville, he rented a Nissan 370Z to get a feel for the car, and rented a Mazda Miata for an autocross school. It paid off, as Ryan is one of the six competitors headed to Silverstone for Race Camp. What is it about Gran Turismo that translates so well to the real world? Surely, Call of Duty leaderboards don't reflect a player's ability carry out real covert combat missions, a successful season of Madden doesn't prepare you for NFL training camp, and no matter how "level 40" your dark elf is, summoning skeletons in real life is damn near impossible. Yet, somehow, this formula playing out in Nashville, and around the world, works. 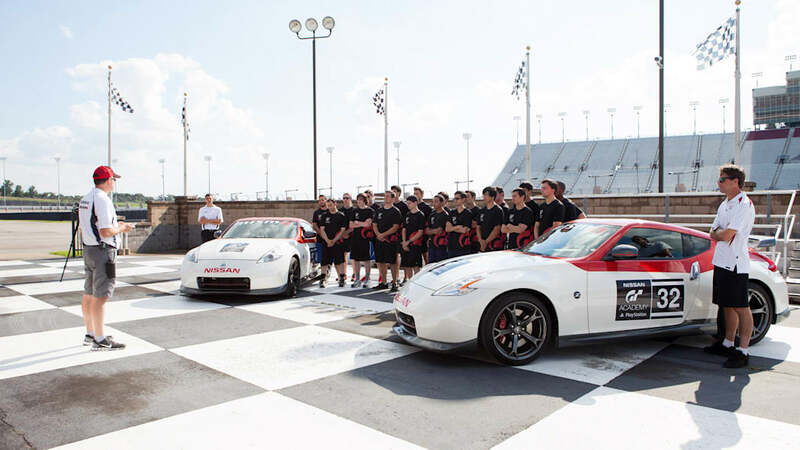 GT Academy has proven itself as a viable route to pro racing over and over again. But how? Why Gran Turismo? 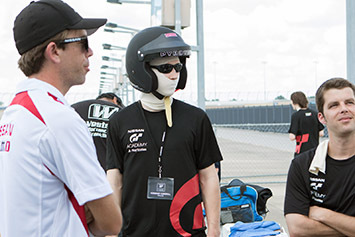 As Hammann points out, the real-world training the drivers get from talented, experienced instructors goes a long way toward making new racers successful. 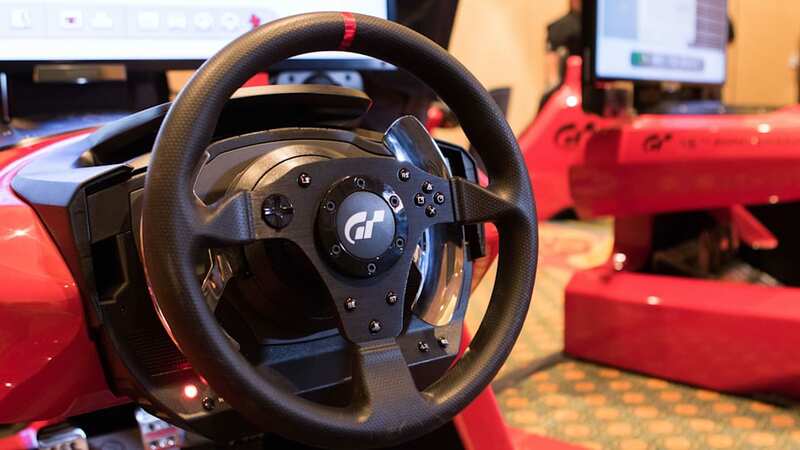 "In Gran Turismo, most people will have a steering wheel and pedals, and the steering wheel has force feedback, so you can feel what the front tires are doing. And that translates directly to a car." Heitkotter, though, had the most satisfying answer to the question I'd been asking everyone. "I think what it is is muscle memory," he says. "In Gran Turismo, most people will have a steering wheel and pedals, and the steering wheel has force feedback, so you can feel what the front tires are doing. And that translates directly to a car." 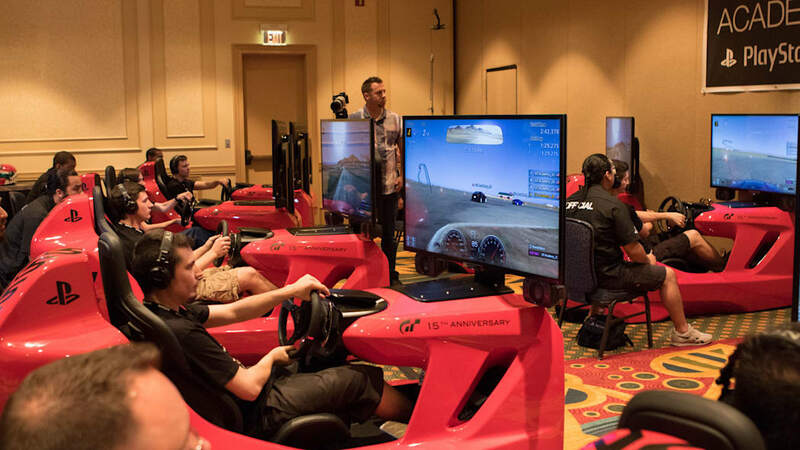 When racing in your living room, you're using the same type of interface that you'd be using in a real vehicle, which is something most other games simply can't offer. It helps develop the same hand-eye coordination that you need when driving a car at the limit. So what do other racers think of these gamers, who are good at Gran Turismo, then get put behind the wheel of a Nissan racecar and begin winning races? To Bryan, it doesn't really matter. 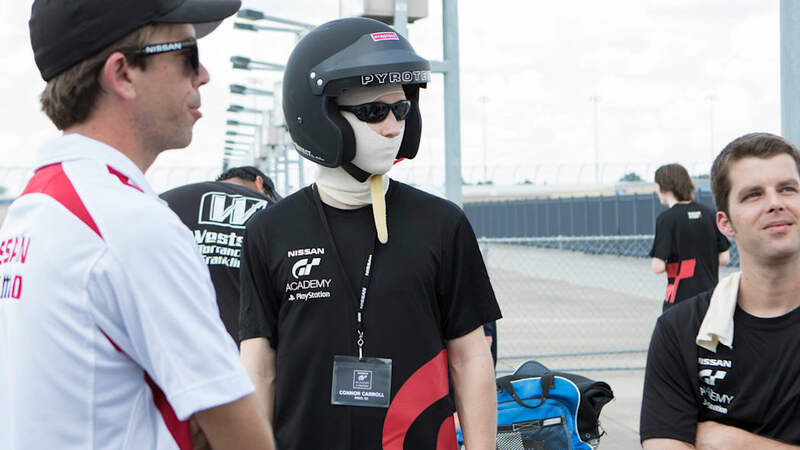 "I think GT Academy has already proven itself." Heitkotter points to the winners who came before him, particularly Lucas Ordoñez. "He proved that the concept is legitimate." 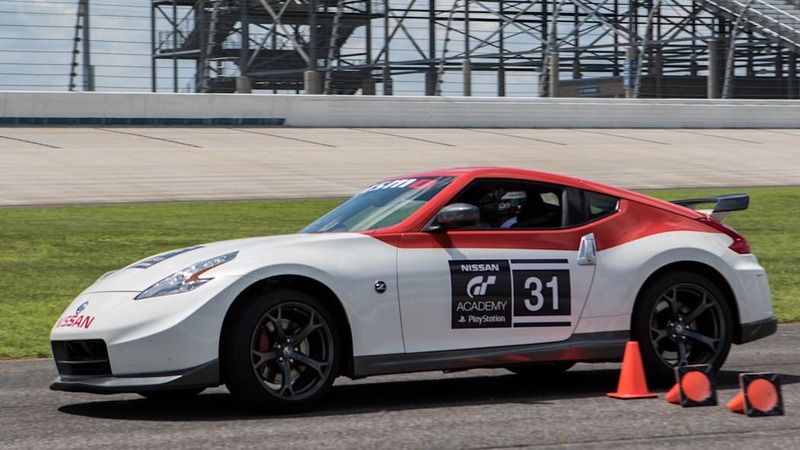 The winners from this year's GT Academy National Finals — Armen Agakhan, Max King, JT Lauro, Ryan Lynch, Vladimir Skirda, and Tyler Utley — are headed to Race Camp at Silverstone. 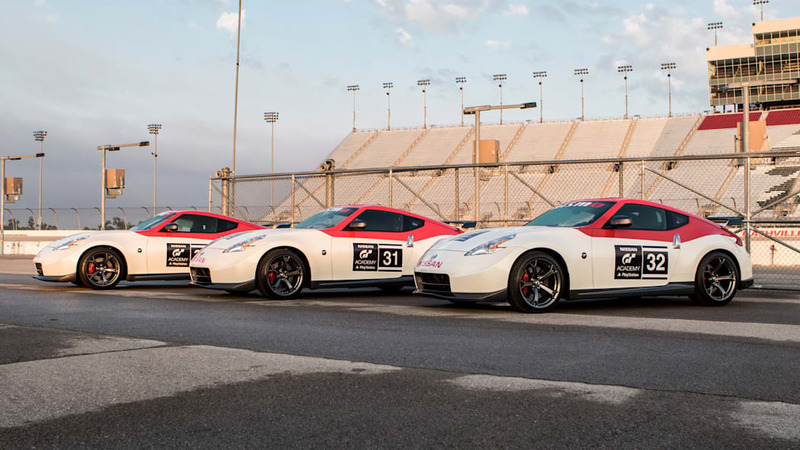 There they'll compete against each other, as well as competitors from Mexico, Turkey, North Africa, and Australia, for the chance to become Nissan's next pro racer. 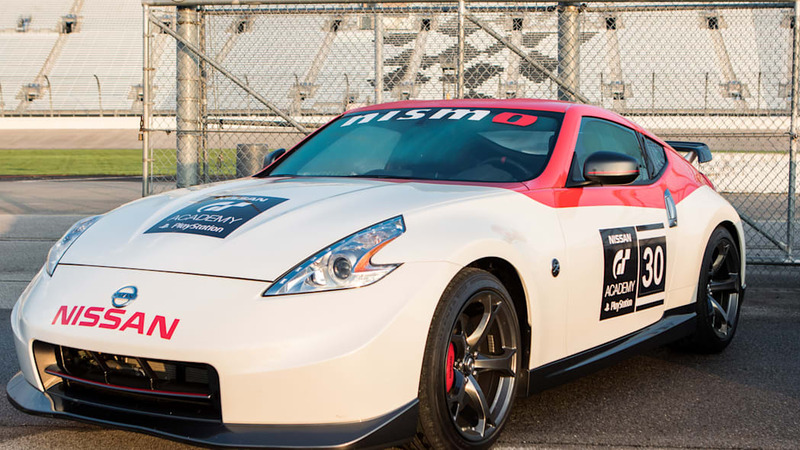 You can follow the competition, which goes from August 6 through August 12, at Nissan's dedicated GT Academy Show website. For these competitors and anyone talented enough to make it into the GT Academy in the future, the past winners offer their own sage advice. "Stay focused at all times, and execute to the best of your ability," says Heitkotter. "You only get one shot at most things, and this is one of those things." Nicolas Hammann gives others the same advice he gives himself: "Have fun and do your best," and also, "Don't leave anything on the table."